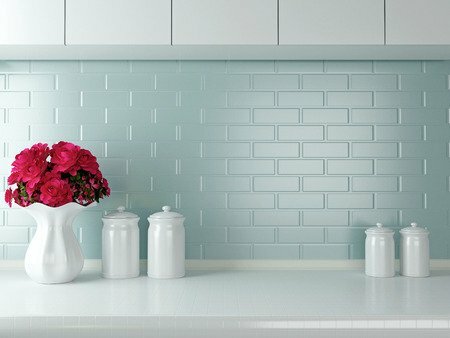 If you’re thinking about going with a retro look for the kitchen, consider trying a 1940’s style. The end of World War II concluded a time when frugality and conservation were necessary. It also ushered in a fresh start for reunited families to enjoy the better things in life. Colors were bolder, and designs were bolder, making this an excellent time period for a retro kitchen theme. Contrasting colors were very popular as well as combinations of bright primary colors with white. Soft yellow sinks were combined with red, blue or mint accessories. Another fashionable combination was all white cabinets with red accents. The distinct use of red, white and blue denotes the patriotic feeling during this time of peace. Green increased in popularity as well. For flooring, a striking geometric pattern gave the kitchen some pizzazz while also complementing the solid color cabinetry. Using a two-tone color scheme in the kitchen was sure to draw the attention of guests while incorporating a new floor with 40’s style pattern helped with the kitchen’s overall design. Popular furnishings included a drainboard sink with steel cabinets surrounding it that came in separate pieces from the stove and refrigerator. While there have been advances in kitchen design, steel cabinets will still give you that beautiful retro look. A replica refrigerator is a perfect piece to add to your space. Kitchen accessories were cheery and bright. Popular patterns for table linens used cherries, apples and even country-style chickens and roosters. Gingham and floral patterns were also widely used. A countertop breadbox and canisters for flour, sugar, coffee and tea were the standard. Cabinets were furnished with stylish glass or acrylic knobs and the eating area would consist of a dinette set with Formica tabletop and vinyl-upholstered chrome chairs. Consider updating a small eat-in table set with chrome legs and topping it off with cheerful colored linens. Add canisters to the countertop for a finishing touch. Don’t be afraid to choose bold color combinations and daring patterns as it will only make your kitchen a more authentic example of the optimistic and joyful look of a real 1940s kitchen.